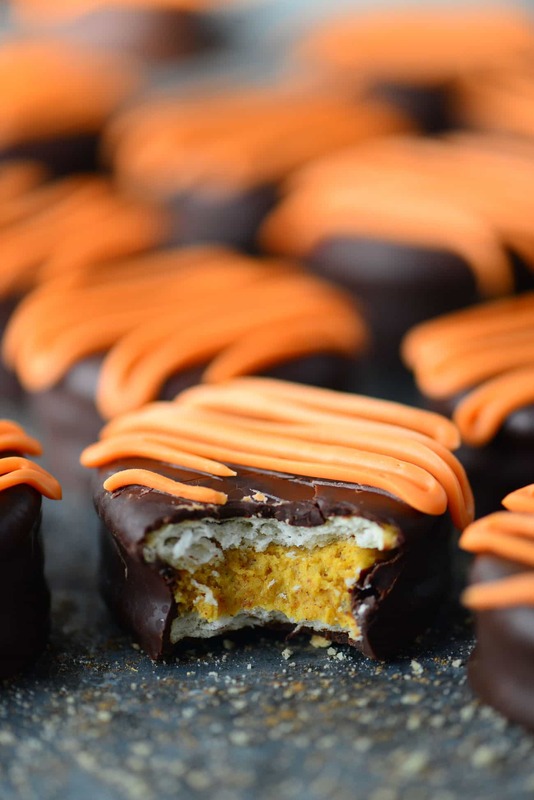 Pumpkin Cheesecake Ritz Cookies are like a pumpkin truffle inside Ritz crackers. 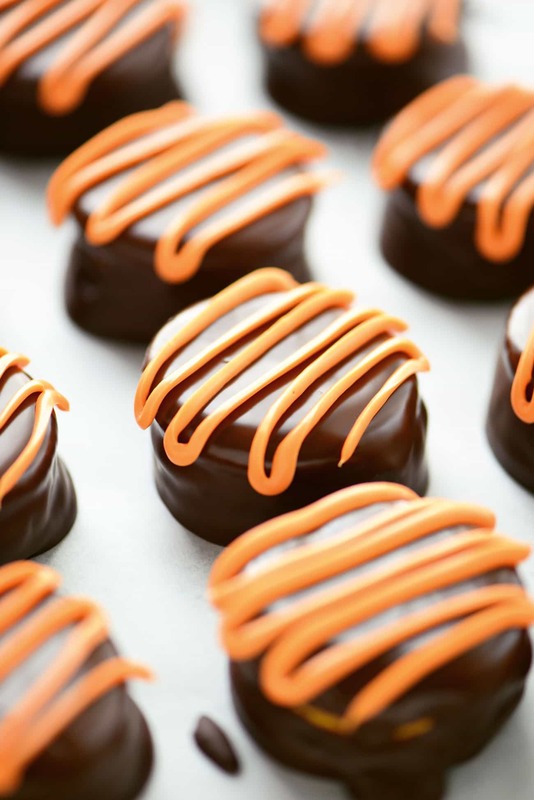 The dark chocolate is the perfect compliment to the sweet pumpkin filling. 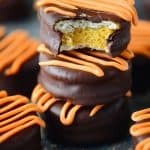 We love making the traditional Ritz cookies with peanut butter in the middle especially during the holidays but I thought it would be fun to make a fall version that included pumpkin. 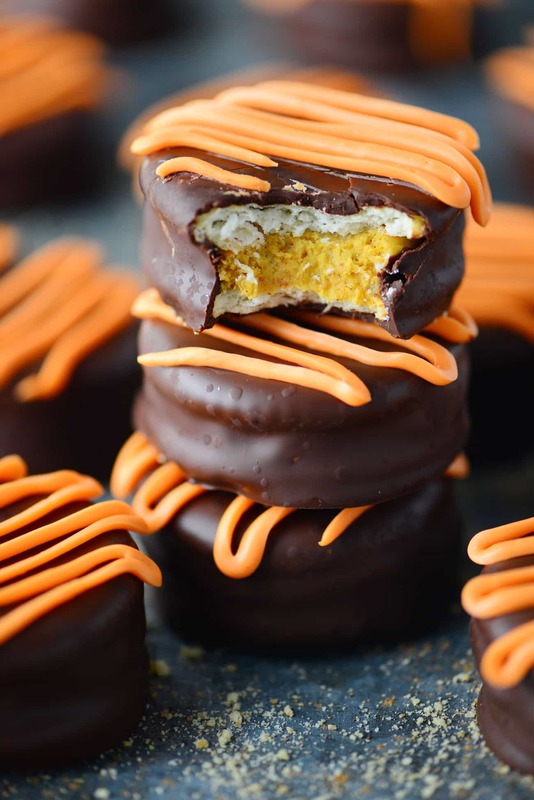 The filling in these Pumpkin Cheesecake Ritz Cookies is similar to what I used to make my pumpkin chocolate chip cheesecake bites. To make the filling for the Pumpkin Cheesecake Ritz cookies, first beat the softened cream cheese. Add the pumpkin puree and marshmallow cream and beat well. Then, mix in the graham cracker crumbs, powdered sugar, and pumpkin pie spice. Scoop about one tablespoon of the pumpkin cheesecake filling onto half of the Ritz crackers. I used my one tablespoon dough scoop so that the filling formed a ball, but a measuring spoon or dinner spoon would work as well. Then, top with another cracker squishing the filling between the two. At this point, you can choose to refrigerate the cookies to allow the filling to harden before dipping them in chocolate. I tested the recipe both ways and had similar results. The main difference was that the chocolate coating hardened faster on the chilled cookies. Melt the dark chocolate chips and shortening in the microwave. Dip the pumpkin cheesecake Ritz cookies in the melted chocolate and place on parchment paper or a silicone baking mat. Allow the chocolate to harden. Then, melt orange candy melts in the microwave and drizzle over the cookies. 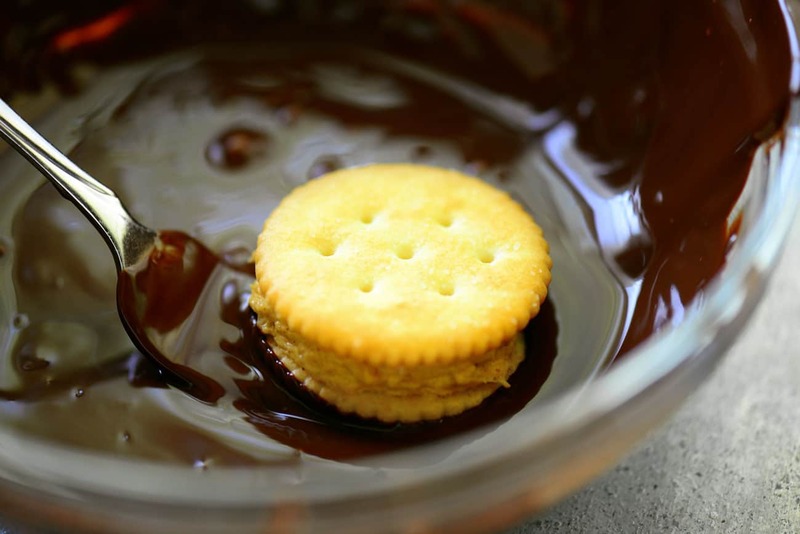 If the candy melts are too thick, you can add about one teaspoon of shortening to thin it. I used a pastry bag to drizzle the candy melts over the cookies. You can also use a plastic sandwich bag with the corner snipped or simply drizzle with a fork or spoon. 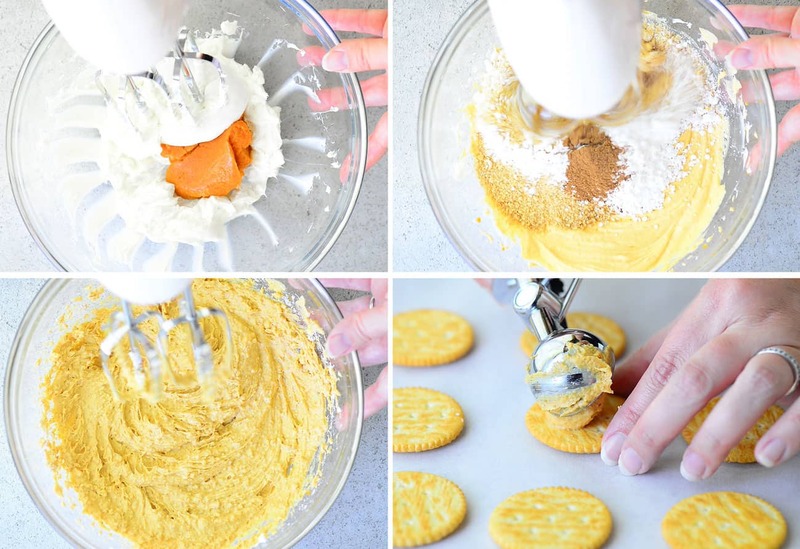 These fun little pumpkin cheesecake Ritz cookies are perfect for fall and super easy to make! They are sure to become an autumn tradition. Beat the softened cream cheese. Add the pumpkin puree and marshmallow cream, beat well. Mix in the graham cracker crumbs, powdered sugar, and pumpkin pie spice. 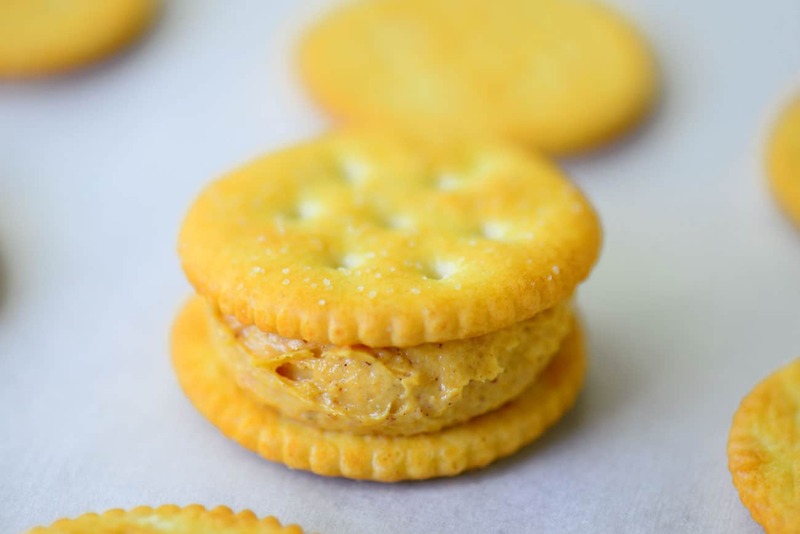 Scoop about one tablespoon of pumpkin cheesecake filling onto half of the Ritz crackers. Top each with another cracker squishing the filling between the two. At this point, the cookies can be refrigerated to harden the filling before dipping, if desired. Melt the dark chocolate chips according to the instructions on the package. Dip the pumpkin cheesecake Ritz cookies in the melted chocolate and place on parchment paper or a silicone baking mat. Allow the chocolate to harden. 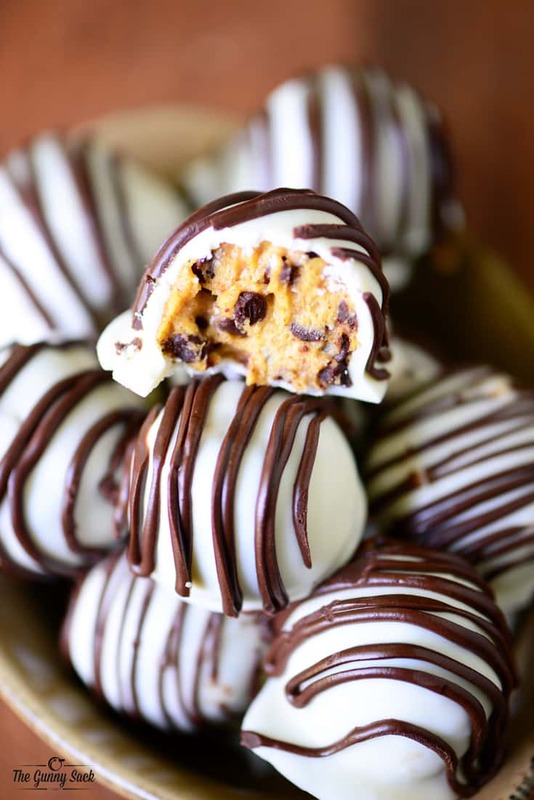 Melt orange candy melts in the microwave according to the instructions on the package and drizzle over the cookies. I used a pastry bag to make this step easier. Made these for my coworkers this week. They loved them! 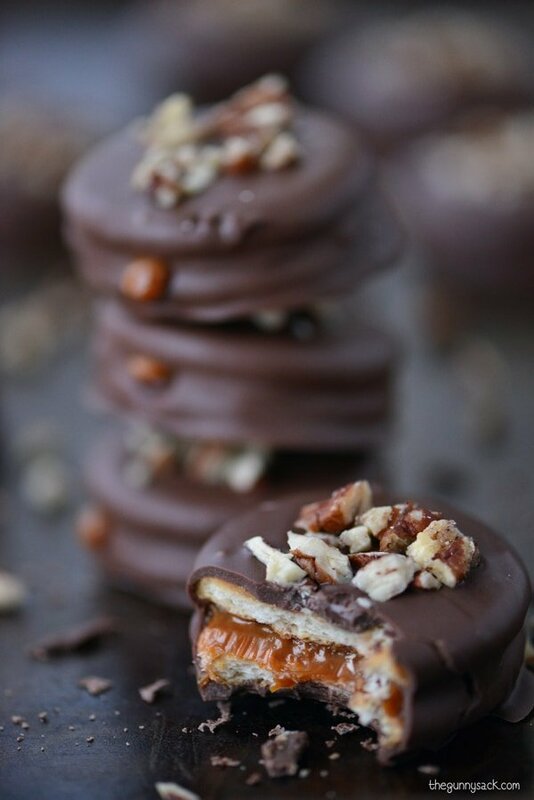 I found myself repeatedly explaining, “Well they’re ritz cracker sandwiches, filled with cream cheese, pumpkin, marshmallow creme and graham cracker crumbs, dipped in chocolate.” Couldn’t find a shorter way to adequately describe them! I doubled the recipe and ended up with about 38 cookies, using a 1tbsp cookie scoop for the filling. I needed about 25oz of the chocolate chips (one 20oz bag + one 10oz bag) instead of 20. I used the leftover melted chocolate to make a quick granola chocolate bark. I didn’t need as much of the candy melt as was suggested, but I did a rather thin (and sloppy) design on each cookie, so your mileage may vary. For the graham crackers, I couldn’t decide whether I wanted actual crumbs or dust. I went more toward the dust end of the spectrum, putting the crackers in baggies and smashing them into oblivion (with the help of my 3yr old of course). The consistency of the filling turned out great.